After purchasing this product, you will be sent a unique Kogan Mobile voucher by email within 24 hours. Once you have your voucher, simply login to your Kogan Mobile account to redeem your unique voucher. You will be able to activate and start using your International Roaming Pack without any additional charge. Travelling soon? Check out our Kogan Mobile International Roaming Pack, perfect for sharing pics, using your favourite apps, maps and calling home while overseas, without worrying about hidden data, call or SMS costs. International Roaming Pack can be used while you are in the following 10 countries (China, Fiji, Hong Kong, Indonesia, Malaysia, New Zealand, Singapore, Thailand, USA & UK). 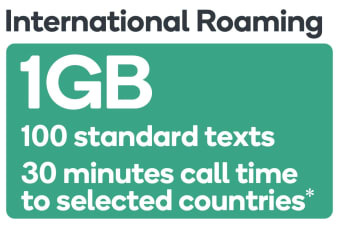 International Roaming Pack inclusions cannot be used within Australia. Standard international voice calls can be made to and received from the 10 countries listed above, plus Australia. Data can be used while you are in one of the 10 countries listed above. SMS messages can be received from any country, and can be sent to any of the 10 countries listed above, plus Australia. You can buy this incredible value International Roaming Pack before you leave home, or while you’re overseas, and add it to your existing Kogan Mobile plan whenever you want to start using it! Need to grab an International Roaming Pack while overseas? The easiest way to buy while you’re overseas at one of the supported countries listed above is to SMS the word ROAM to 12612 from your mobile and pay with the credit card stored on your account. Or, purchase via the Kogan Mobile app, use your online account or call customer support on 12612 from your mobile or +61399013120 from a different handset. Use multiple vouchers at once! You can have up to five International Roaming Packs active on your plan at any one time. For example, if you had five activate simultaneously, you would get 5GB of data, 500 SMS messages and 2.5 hours of international standard voice calls to use within 24 hours. Or, you can purchase multiple International Roaming Packs at once from Kogan.com to use over more than a 24 hour period. You will receive an email with each voucher, which you can activate when you want the 24 hour period to commence. *Valid for existing Kogan Mobile customers only. Personal use only. Available on a Kogan Mobile International Roaming Pack, purchased before 11:59pm AEDT 30/11/2019 unless sold out prior or extended. Not available for commercial or resale purposes. Not transferable and not redeemable for cash. ~Selected Roaming Countries are New Zealand, USA, UK, Hong Kong, Singapore, China, Malaysia, Indonesia, Thailand and Fiji. Countries may change from time to time. Check here for list of current countries before you travel. Fair Use Policy applies. You can only use an International Roaming Pack if you are an existing Kogan Mobile customer with an active account and recharge. New Kogan Mobile Customers who activated a SIM will need to recharge with Kogan Mobile Recharge Products before purchasing an International Roaming Pack. Where the International Roaming Pack is purchased from Kogan Mobile, the expiry period will begin immediately after purchase. Where the International Roaming Pack is purchased as a voucher, the expiry period will begin from activation. Unused inclusions will be forfeited at the end of the International Roaming Packs Expiry Period. Unless stated otherwise, International Roaming Packs can only be purchased via Online/Mobile, by SMS or over the phone. Standard incoming and outgoing voice calls includes calls to and from mobiles and land lines excluding premium services, overseas freephone numbers, video calls, re-routed calls and cannot be used for commercial purposes or for resale purposes. Both outgoing and incoming voice calls are charged in per 1-second increments. Standard TXT includes standard outgoing TXT and excludes any picture text or multimedia messages.